Last Thursday night, Travis Air Force Base in California held its annual Christmas tree lighting. In a lame attempt to avoid complaints of not being religiously inclusive, a small menorah was included in the base's "holiday" display along with the tree and a nativity scene. The photo below shows what I mean by small. 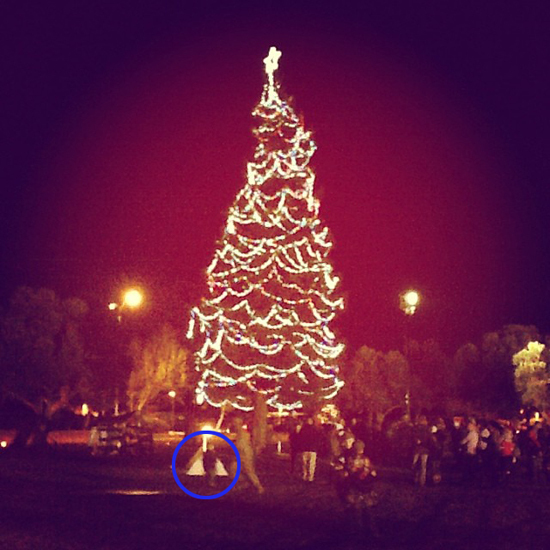 The menorah, which appears to be painted on a piece of wood, is that little thing -- not even as tall as the small child standing in front of it -- circled in blue in the photo below. The size of the menorah compared to the Christmas tree is, of course, the "too little" part. But it was the "too late" part that caused someone attending the tree lighting to contact the Military Religious Freedom Foundation (MRFF) from the event. What was the problem? The base, while including the obligatory Jewish thing to feign inclusiveness and avoid complaints, apparently didn't even bother to find out when Hanukkah was, or just didn't care. The beginning of Hanukkah coincided with Thanksgiving this year, something that was pretty widely reported because of its rarity. Lighting the menorah as part of the Christmas tree lighting ceremony meant that the menorah wasn't lit until the last day of Hanukkah! For the first seven days it wasn't lit, if it was even in place yet. That's Travis Air Force Base's version of religious inclusiveness. Hey, Hanukkah is sometime around Christmas, right? So just throw a little menorah into the Christmas display and, voilà, you got yourself an inclusive "holiday" display. Now those evil "war on Christmas" people can't complain that the display is exclusively Christian. Problem solved. Who cares when Hanukkah actually is? While our military bases have to at least make some show of recognition of religions other than Christianity -- however half-hearted and obviously ungenuine that show might be -- the same does not hold true for the rank and file "Christians." They are free to express their true feelings towards their Jewish brethren, and express those feelings they do. is for your wife and children to have there heads explode with brain anyerisms. similtaniously. but not for you mickie jew. We want you to live with it for years and years to come. what the righteous hand of our Lord and Savior struck your little loved ones down with. and to think about it. its all because of you. What you and your father satan do. to keep the Only true Lord Christ from our marines and flyers and soldiers. And from our nation. you think Jesus will not make you pay dearly? for your wickedness mickie jew? think again when you bury them all. if you love the US of A thank a Christian. semper fi And Merry Christmas. Yeah, Merry freakin' Christmas to you, too. You do understand that you're celebrating the birth of a Jewish guy, right?